Tāwharautia te reo o Mātaatua! What is the Mātaatua Investment Plan? 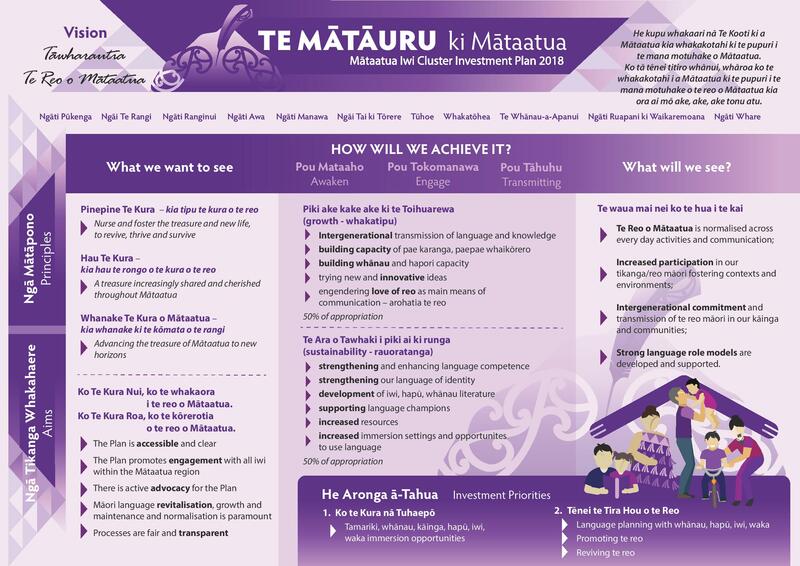 Te Mātāuru ki Mātaatua is the plan for how Te Mātāwai will be investing in te reo Māori revitalisation in the Mātaatua rohe and its iwi: Ngāti Pukenga, Ngāiterangi, Ngāti Ranginui, Ngāti Awa, Ngāti Manawa, Ngāi Tai ki Tōrere, Tūhoe, Te Whakatōhea, Te Whānau-a-Apanui, Ngāti Ruapani ki Waikaremoana and Ngāti Whare. The Mātaatua Investment Plan was developed by a core group of te reo Māori advocates and champions from across the Mātaatua region called Te Pae Motuhake o Mātaatua (The Mātaatua Investment Panel). The plan aligns with the Maihi Māori with an overall strategy for te reo Māori revitalisation in homes and communities. Who is responsible for the Mātaatua Investment Plan? Te Pae Motuhake ō Mātaatua, representing iwi and Māori will monitor the plan alongside Te Mātāwai. All Māori language stakeholders within Mātaatua and iwi listed in the Mātaatua Kāhui ā-Iwi have a direct interest in the implementation of the plan. What are the key parts of the Mātaatua Investment Plan? Ngā Mātāpono-The Principles:are aimed at achieving the growth and sustainability of Te Reo o Mātaatua. Ngā Hua-The Outcomes: are about what we expect to see through the investment in growth and sustainability of Te Reo o Mātaatua. We want to see and hear te reo o Mātaatua being used naturally and widely in communities throughout Mātaatua because we want to promote te reo Māori as a nurturing first language in Mātaatua homes and in Mātaatua communities. Supporting parents and grandparents to be transmitters of the language to younger generations. Supporting whānau, marae and communities to create and implement language plans. As well as supporting long-standing Māori language organisations to create and maintain immersion opportunities within communities. And by supporting the creation of Māori language resources that assist whānau and communities to use the language more in the home and in the community and to participate effectively in immersion environments. -And more resources to support Māori language being used in the home and in the community. What are the funding priorities for investment activities? 1) Key investment Area 1: Ko te kura nā Tuhaepō – tamariki, whānau, kāinga, hapū, iwi, and waka immersion opportunities. 2) Key Investment Area 2: Tēnei te tira hou o te reo! – Promoting and reviving te reo through language planning with whānau, hapū, iwi and waka.